Best-selling author Winston Groom tells the complex story of how Franklin Roosevelt, Winston Churchill, and Joseph Stalin--the three iconic and vastly different Allied leaders--aligned to win World War II and created a new world order. By the end of World War II, 59 nations were arrayed against the axis powers, but three great Allied leaders--Franklin Roosevelt, Winston Churchill, and Joseph Stalin--had emerged to control the war in Europe and the Pacific. Vastly different in upbringing and political beliefs, they were not always in agreement--or even on good terms. But, often led by Churchill's enduring spirit, in the end these three men changed the course of history. Using the remarkable letters between the three world leaders, enriching narrative details of their personal lives, and riveting tales of battles won and lost, best-selling historian Winston Groom returns to share one of the biggest stories of the 20th century: The interwoven and remarkable tale, and a fascinating study of leadership styles, of three world leaders who fought the largest war in history. WINSTON GROOM was born in Washington, D.C., but grew up in Mobile, Alabama, on the Gulf Coast. After a brief period in the Army, Groom returned to Washington, where he worked as a reporter at the now defunct Washington Star, covering the political and court beat. He enjoyed a stint in New York City socializing with literary legends before returning to Alabama, where he settled down to writing and enjoying life. He is the author of 18 previous books, including Forrest Gump, turned into an Oscar-winning movie, The Generals, and The Aviators. 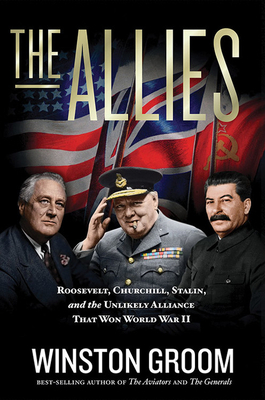 "A superb history of the three leaders who guided the world during WWII: Franklin Roosevelt, Winston Churchill and Joseph Stalin. Not only did these three political giants direct the strategy of the war, they contributed to the future direction of the world by decisions made at the war’s conclusion. Although I have read books and viewed movies that detailed specific battles and places, Groom did a lovely job weaving a story that pulled the events together into a broad perspective which I thoroughly enjoyed. And as I have come to expect in all his histories, the anecdotes were fascinating and I learned new details about the characters and the events in play. A powerful story!"